Xin Wang, an automotive engineer from China has been a lover of all things Italian for many years. After visiting the Ferrari factory in Maranello several times and having tasted authentic Italian gelato, he decided to make a drastic change in his career and respond to a growing demand for Italian food products in China. His goal was to open an authentic artisan gelateria in Nanjing, his home town. He had already come to Italy to take part in what he calls a ‘pseudo’ artisan gelato making course with a large industrial gelato company, but went home disappointed due the fact that he hadn’t learnt how to make the creamed and sorbet bases from scratch and was obliged to use the company’s ready-made bases (which had been adapted to the Asian market) and machines. Yummy Italy, together with our local award-winning artisan gelateria, put together a two week intensive one-on-one programme for him to learn everything from scratch – from the techniques for creating both creamed and sorbet gelato recipes according to his clients’ tastes and according to the ingredients he had available locally, to selecting the right machines for his products, ingredient selection, recipe balancing, basic retail / visual marketing techniques for the gelateria as well as support in testing various recipes when he returned to China. 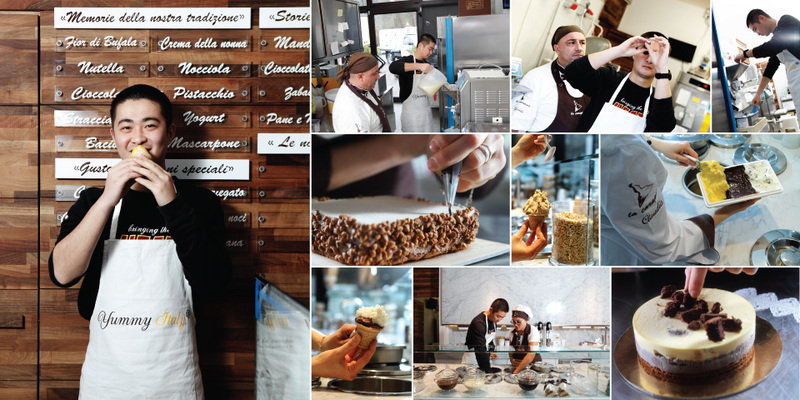 Part of his training included spending time in the gelateria and learning how a professional artisan gelateria is run. Wang’s gelateria opened in September 2015. He says “I am so happy that we are finally open and it has been a very successful month. The Italian tourists who passed through complimented me on the high and authentic quality of the gelato. Thank you to each and every on of the Yummy Italy team that helped me make my dream become a reality”.